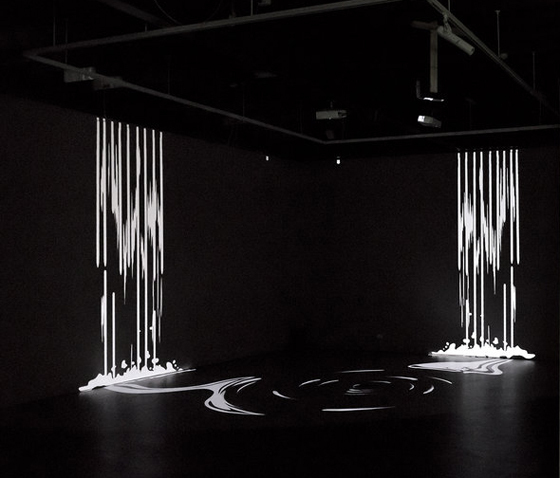 Torrent is a 3-screen digital animation by Martine Corompt - one of a series of multi-screen animations dealing with water flow Martine has been producing since 2010. The style of animation is monochromatic, with high-contrast black & white shapes forming the abstracted movement of water dynamics, currents and dispersion. The score for Torrent is composed, engineered and produced by Philip Brophy. It is based around a series of directed performances and improvisational passages by harpist Mary Doumany. Torrent incorporates two side screens positioned as custom built vertical walls onto which 2 parts of the animation are projected. A third screen is positioned on the floor between the 2 side screens, containing a projection of the 3rd part of the animation. 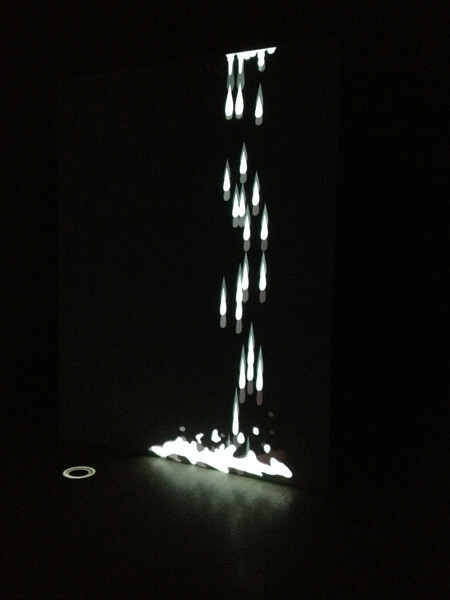 The full animation depicts drops of water which accumulate in the upper corner of each of the side-screens, then develop into streams, eventually becoming gushes of water falling to the floor. 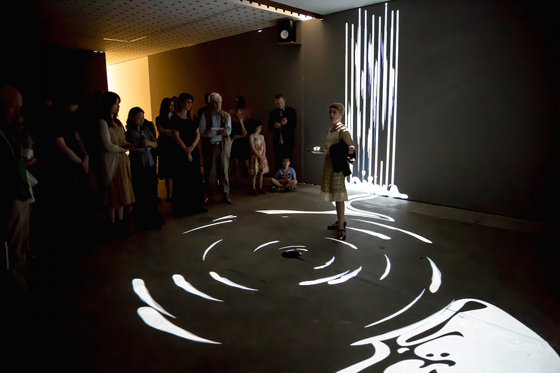 Snaking lines of current consequently flow onto the floor projection, gaining momentum to form a swirling whirlpool. The pool grows in intensity, then gradually subsides as the water flowing from the side screens ceases. 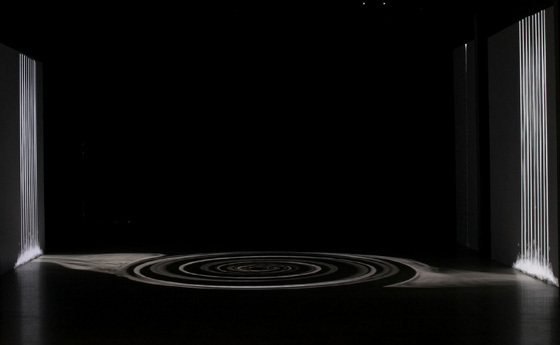 According to Martine, "Torrent takes its name from the idea of an animated projected sequence portraying the process of water trickling, pouring and cascading down the surface of two facing walls and then swirling onto the floor as a stylised black & white animated whirlpool, and then finally draining away to nothing. In this way the image of the waterfall whirlpool may be both allegorical and spectacle, and be considered simultaneously benign and majestic bringing to mind the relaxation desktop screensaver, the grandiose power of an actual waterfall, as well as the malevolent spectacle of a natural disaster and the incongruity of seeing water flowing from places where it normally shouldn’t." For the score, Martine requested a harp to be the central identity, playing upon the historical iconography of the harp and its associations with swirling water. For Martine, "the evocative sound of the harp continues the metaphorical representation of water without realism. There are no water recordings in the composition, only harp, both natural and processed oscillating between representation and abstraction, combining melodic muzak-like gestures with more unfamiliar abstract harp sounds." Initial discussions on the music for Torrent centred on the relation between the representational weight of the animation - its instant impression of flowing, running water - and the overtly abstract sensation of the imagery - the fact that the whole animation is in stark black & white, and is devoid of any realistic effect or texture. Having heard the use of the harp in Atmosis, Martine was keen to use harp for Torrent. It was agreed that the harp could bear the weight of being the archetypal instrument associated with water, as well as a sonic device well-suited to rich textural effects. Martine delivered a rough timing for the 7 minute piece, outlining the general 'narrative' of movement of water across the 3 screens. She devised a cycle that starts off as a trickle and grows through a series of mounting intensities, ending in everything disappearing down a plug-hole. With these sections in hand, a series of 'passages of intensity' were scripted for the score. Mary Doumany (who performed the harp in Atmosis) suggested working with two of her harps - one with nylon strings, the other with gut strings. To exploit the resonant qualities of the harp, the composition was kept in the key of Eb. The score was then parsed into two recording sessions - one for the nylon harp, the other for the gut harp. The idea was to build a matrix of harmonies, building up in 3rds, 4ths and 6ths, creating a general tonal 'swelling' between what ended up sounding like a whole tone (Eb and F). This illusion results from an overload of the notes cascading upon one another (Mary mostly performs fast 'trilling' on the harp to enhance this blurring effect), so that everything sounds conventionally harmonic, yet starts to create shadowy doubts about the harmonies the closer one listens to them. The harps were recorded in a standard stereo fashion (one angled above the neck, the other lower near the body). Each of the score's sections (indicated below) was recorded for passages of around 90 seconds. The idea was not to fade up and down these sections in the final mix, but to have the acoustic feel of the harp being started and then stopped after a period. These recordings were then tracked to create sections of appropriate textural/harmonic density, with the upper register passages relating to the flow of water moving into the central whirlpool, and the lower register passages being synched to the main section of the animation when the whirlpool is at its strongest. For the improvisation sections, the harp was prepared using felt to create deadened plunks, and a drum snare positioned on the main body of the harp to generate long sustained rasping. Finally, the sections were configured with spatialization in mind. 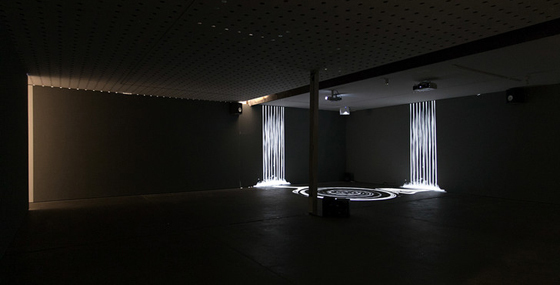 The central idea was to situate the harmonic blurring between the 2 harps (for example, the stacked 4ths of each of the harps, each recorded in stereo) as a quadraphonic space, locating this mostly in relation to the central floor projection containing the whirlpool. The build-up and the break-down of the piece would be distributed according to the amount of action on the side screens, requiring those harp passages to be assigned to the relative speakers outside of the quadraphonic space in the centre. However more detailed discussion about the actual spatial set-up for the animation was needed to get a sense of how many speakers could be used, where they would be placed, and what kind of spatial file encoding would work best. It was decided to employ a 5.1 configuration, using a central speaker placed under the floor of the floor projection, a set of 4 speakers surrounding the floor projection, two of which would be placed at floor level, the other two speakers nearer to the ceiling, one for each of the upper action of the wall projections. The track-laying and mixing was carried out according to this plan, and the mix was encoded in Dolby Digital 5.1.